Q: Will Canon be introducing more DSLR cameras? A: Yes. Canon still sees demand for all sorts of camera - including DSLR and mirrorless - so we will continue to produce across multiple product lines. We've only just phased out the EOS-1 film camera because there were still people buying it in certain markets, and we will see the same with the DSLR cameras. 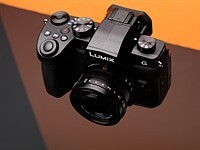 There are certain technologies where we don't think mirrorless is quite ready - the electronic viewfinder for instance - compared to the SLR system where there is zero lag through the viewfinder. So there you have it. Barring a complete collapse in DSLR sales and a major rethink, it doesn't look like DSLRs or EF lenses are going away anytime soon. Not a major surprise to those who understand how Canon approaches the market, especially for professional bodies, but might put a few people's minds at ease. At the show, I also discussed another issue I have with EVF - you can't quickly set a selective DoF by holding down the DoF Preview button while adjusting aperture and focus point; the EVF makes everything look sharper than it might be. This is particularly important for wildlife and action photography where you might only have a second or so to get the shot, and again, this was acknowledged as an area where mirrorless "isn't quite there yet". (Actually, I'd say it's got quite a long way to go here, given how subtle this can be and the number of pixels an EVF would need to have in order to enable an accurate setup). No comment on whether the EOS R Professional might potentially be out in time for the 2020 Olympics, before you ask. Reading between the lines, I'd guess the priority is 110% on getting the 1DX3 out in time for the games, and the R-Pro's Olympics availability hinges on how smoothly that goes.